Cover of the April 2010 issue. Christianity Today magazine is an evangelical Christian periodical that was founded in 1956 and is based in Carol Stream, Illinois. The Washington Post calls Christianity Today, "evangelicalism’s flagship magazine." 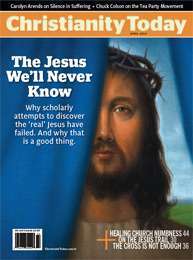 Christianity Today magazine has a print circulation of approximately 118,000, of which approximately 36,000 is free, and readership of 260,000, as well as a website at ChristianityToday.com. The founder, Billy Graham, stated that he wanted to "plant the evangelical flag in the middle-of-the-road, taking the conservative theological position but a definite liberal approach to social problems". Graham started the magazine as counterpoint to The Christian Century, the predominant independent periodical of mainline Protestantism, and as a way to bring the evangelical Christian community together. The New York Times describes Christianity Today as a "mainstream evangelical magazine." The first issue of Christianity Today was mailed October 15, 1956, and the opening editorial, Why 'Christianity Today'?, stated "Christianity Today has its origin in a deep-felt desire to express historical Christianity to the present generation. Neglected, slighted, misrepresented—evangelical Christianity needs a clear voice, to speak with conviction and love, and to state its true position and its relevance to the world crisis. A generation has grown up unaware of the basic truths of the Christian faith taught in the Scriptures and expressed in the creeds of the historic evangelical churches." Its first editor was Carl F. H. Henry. Notable contributors in its first two decades included contributions from F. F. Bruce, Edward John Carnell, Frank Gaebelein, Walter Martin, John Warwick Montgomery, and Harold Lindsell. Lindsell succeeded Henry as editor and during his editorial administration much attention centered on debates about biblical inerrancy. Later editorial leadership came from Kenneth Kantzer, Terry Muck, and David Neff. The current editor is Mark Galli, and the publication now includes print, online, and various ancillary products. Katelyn Beaty is managing editor of the print edition, and Richard Clark is managing editor of news and online journalism. Contents of print and online include feature stories, news ranging from cultural issues from a Christian viewpoint to the global church, opinion, reviews, and investigative reporting. In Billy Graham’s 1997 autobiography, Just As I Am, he writes of his vision, idea, and history with Christianity Today and his early meeting with oil company executive, John Howard Pew, to establish the publication. The magazine's mission statement is to "provide evangelical thought leaders a sense of community, coherence, and direction through thoughtful, biblical commentary on issues and through careful, caring reporting of the news." Its presence on the Internet began in October 1994 when it became one of the top 10 content providers on all of AOL. Then, in 1996, their website was launched. It was originally named ChristianityOnline.com before becoming ChristianityToday.com. Today ChristianityToday.com serves as the web home for Christianity Today magazine, which now has distinct sections for Local Church Pastors, Reporting,  Women, History,  and Spanish  readers. At the ministry's web home, ChristianityToday.org, all other brands for Christian thought leaders and church leaders are featured, including publications like the intellectual Christian review, Books & Culture, and the website for pastors and church leaders, CT Pastors. Additional web resources include Men of Integrity and Preaching Today. All Christianity Today brands together reach more than 2.5 million people every month when print and digital views are combined, plus more than 5 million pageviews per month on the Internet. The ministry offers access, both premium and free, to over 100,000 articles and other content on their various websites. A Korean-language edition, Christianity Today Korea, was launched in June 2008. A Portuguese-language edition, Christianity Today Brazil, was launched in October/November 2007. Two international editions of Leadership Journal were launched in 2012: an African edition in September (English), and a Portuguese edition in October. Books & Culture is published six times a year and is a book review and intellectual journal modeled after the New York Review of Books and New York Times Book Review. According to its advertising page, the magazine's circulation is 11,000 and its readership is 20,000. It is edited by John Wilson, and notable recent contributors include Mark Noll, Lauren Winner, Alan Jacobs, Jean Bethke Elshtain, and Miroslav Volf. Christian History was a journal of the history of Christianity, first issued in January 1982 by the Christian History Institute. Each issue had multiple articles covering a single theme. Initially published annually, it became a quarterly publication. Christianity Today took over ownership of the magazine beginning with issue number 22 in 1989; it was later discontinued after the publishing of issue 99 in 2008. In 2011 the Christian History Institute resumed quarterly publication of the magazine. Christian History archives can still be found on ChristianityToday.com under its special section. 1 2 "Christianity Today Advertising - Connecting You with Christian Audiences". christianitytodayads.com. Retrieved 10 November 2016. ↑ Lupfer, Jacob (10 June 2015). "Why a 'yes' to gays is often a 'no' to evangelicalism". Washington Post. RNS. Retrieved 11 June 2015. 1 2 Christian Smith, Michael Emerson, "American Evangelicalism: Embattled and Thriving". University of Chicago Press: 1998, p. 12. ↑ Leland, John (26 December 2005). "New Cultural Approach for Conservative Christians: Reviews, Not Protests". New York Times. Retrieved 11 June 2015. ↑ Graham, Billy. (1997). Just as I am: the autobiography of Billy Graham. Grand Rapids, Mich.: Zondervan. ISBN 9780060633875. p. 288. ↑ "The Local Church". christianitytoday.com. Retrieved 10 November 2016. ↑ "Gleanings - ChristianityToday.com". christianitytoday.com. Retrieved 10 November 2016. ↑ "CT Women". christianitytoday.com. Retrieved 10 November 2016. 1 2 "Christian History - Learn the History of Christianity & the Church". christianitytoday.com. Retrieved 10 November 2016. ↑ "En Español". christianitytoday.com. Retrieved 10 November 2016. ↑ "ChristianityToday.org". christianitytoday.org. Retrieved 10 November 2016. ↑ "ChristianityToday.com". christianitytoday.com. Retrieved 10 November 2016. ↑ "BooksAndCulture.com – Christianity Today Advertising". christianitytodayads.com. Retrieved 10 November 2016.